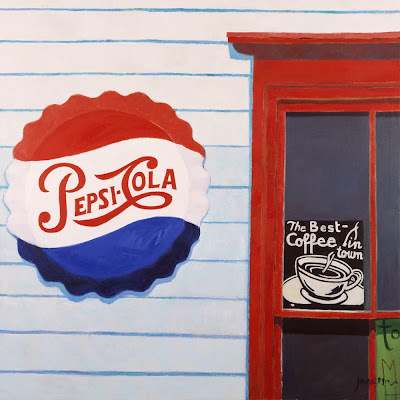 As this weekend is the last chance to see the Paisley Art Institute Annual Exhibition I thought I'd put up my painting of Hope General Store. The store in Hope, Maine is owned by Scotsman Andrew Stewart. The painting is due to appear in my exhibition of New England paintings in Richmond in September but is currently on show in Paisley. Rory McLauchlan is one of the four Aspect Prize finalists from last year. After studying Graphics in Glasgow, Rory travelled south to study at St. Martins. 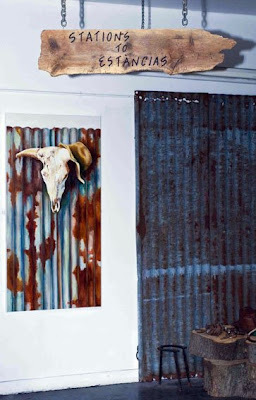 Textile design brought him back to painting and he is currently exhibiting in several galleries. Work is due soon in London's Catto Gallery as well as the new Lime Tree Gallery in Bristol. You can also see his work in the Paisley Art Institute Annual Exhibition in the Paisley Museum & Art Galleries. This is the last weekend of the show so if you have not already been then this is your last chance. 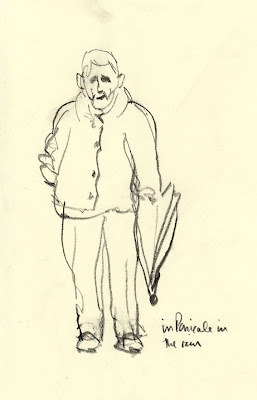 It's raining again so I thought a wee sketch of a little old man in Panicale in Umbria with his umbrella might capture the day's mood. Panicale is near Lake Trasimeno and has a fabulous restaurant. Nice guitar in front of Sue Biazotti's Red painting. Sue is teaching in Crete for the next couple of weeks. Now that the holiday weekend is over the sun has come out. Typical West of Scotland. Isn't this a great entrance bell display. It's in Italy. Opening this evening (5pm) and running until Wednesday June 17th is the Accord Hospice Annual Art Exhibition. This is held in the fabulous India of Inchinnan building, Greenock Road, Inchinnan. This exhibition is a real mixture of work from a wide variety of artists set in a wonderful building. All Art Deco enthusiasts should see the frontage and the interior details which have been preserved in this rescued building. There is an excellent café and good parking. 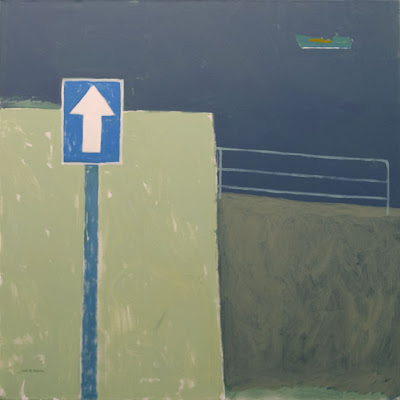 Toby Messenger is a Scottish artist who is highly influenced by American painters such as Richard Diebenkorn (remember the Ocean Boulevard series?) 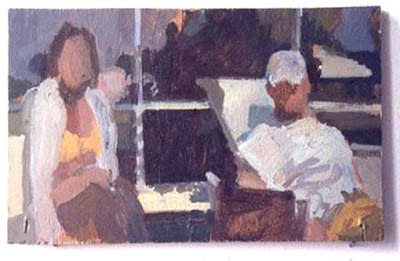 and Fairfield Porter. 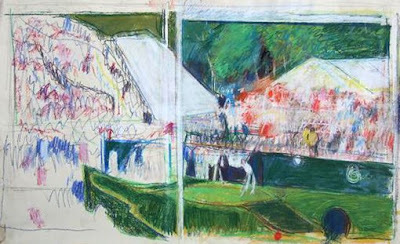 Toby was one of The Aspect Prize finalists who took part in the London exhibition this Spring. He draws and paints both from life and from printed material that he comes across. 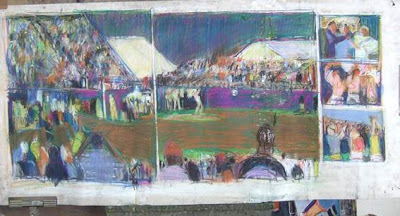 This is a cross section of his work that covers several years. It might feel like winter at the moment but this photo is to remind you that winter was a whole lot nicer than it is now. A little bit of nostalgia and colour to brighten up your day. A rally of fifties and sixties cars at Owls Head in Maine. OK folks...a rare occasion. Appearing on my own blog! Here I am yesterday evening doing a book signing. Survived despite the ghastly cold that has invaded the nasal passages. Colds should not be allowed in May. I mean, it's just not fair. They should happen only in winter when everyone feels miserable anyway and after all they are called colds not hots or warms so they should happen when it's cold. What do you mean it IS cold. It's May. But sadly a cold May. So I have a cold May cold. At least it's not Swine Flu. Did this one on Deer Island in Maine. 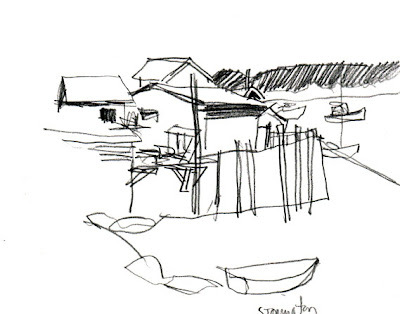 Sometimes it's easier to capture the immediacy of a line with pencil than it is with a paintbrush. That's why I like this sketch. A fine display of pots and lace. Could be France but it's not. This is one of the paintings that is going into my exhibition of paintings from New England that will be at the Richmond Hill Gallery in Richmond in September. Canoes in Maine. They are like a colour chart. For those of you who enjoy seeing the garden, this was it before four days of wind and rain blew it apart. It will settle again when the weather subsides. Janet Melrose. 'Nothing is without danger'. Acrylic on paper. 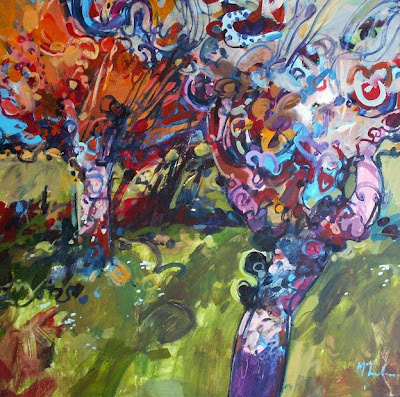 22" x 30"
Janet Melrose. 'One Way' . Acrylic on Canvas. 36" x 36". Janet studied at Edinburgh College of Art and lives in Perthshire. Last year she was a finalist in The Aspect Prize and took part in the Finalists Exhibition in London's Cork Street. 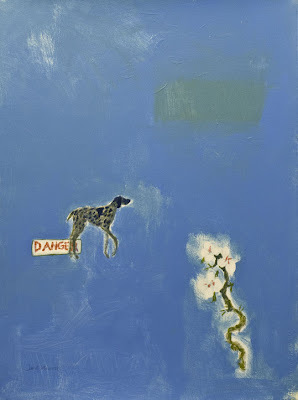 Janet is currently working towards an exhibition at Frames Gallery in Perth. Keep an eye out for that. She also exhibits at the Strathearn Gallery, Perthshire and the John Davies Gallery in Gloucestershire. Wickedly good cake in the village hall café over the weekend. Managed to restrain myself and have only one slice. 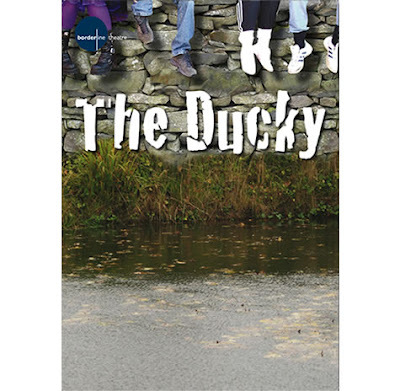 Went to the premiere of D.C.Jackson's new play 'The Ducky' on Saturday evening. Produced by Borderline Theatre and starting an extensive tour of Scotland, this has to be the play to see this year. Jackson has a memorably irreverent wit and an understanding of the human condition which combined give moments of pure theatrical joy. Jackson's increasing skill in manipulating the dramatic to make his point bring the story of these young people struggling to find their place in the world to some hilarious highs and devastating lows. The script is brilliant, acting and direction first class and it all takes place on a very clever, well lit set. Bravo Borderline (who have, in my humble opinion, always been Scotland's Unofficial National Theatre). I don't often put up more than one subject a day but Vanessa Lawrence phoned to let me know about her exhibition and then emailed me some info and I think it looks great. It is impossible to read the poster on the blog so here's the info. The exhibition runs until Sunday in the SWG3 Studio Warehouse Gallery at 100 Eastvale Place, Glasgow G3 which is off Kelvin Haugh Street. This is an old factory building which is used as artist's studios. It is at the end of the street on the right opposite some railway arches. The Paisley Art Institute Annual Exhibition opens this evening and will run for a month. It is an extraordinarily good exhibition with a wide variety of work (301 pieces) covering four galleries in one of the finest exhibition spaces in the west of Scotland. The bronze sculpture above is Simon Mandby's 'Where are we going'. After a huge effort some years ago to attract sculptors, the exhibition now boasts a good number of fine works. These galleries take well to a mixture of painting and sculpture. Watch out too for Cara Broadley's fabulous ceramics which are in a glass case by the door to gallery four. The exhibition is held in the Paisley Museum & Art Galleries, High Street, Paisley. Entrance is free. The Gallery is closed on Mondays and on Public Holidays.